If you're interested in a profession where you can make a difference, then nursing may be right for you. Nursing is a challenging and rewarding career on the front-line of patient care. 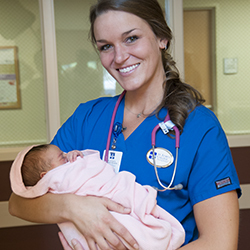 The Nursing program combines the art and science of nursing to provide a holistic approach to patient care. Registered nurses utilize their knowledge and compassion in managing the care of patients in a variety of healthcare settings. Graduates of the nursing program are eligible to make application for licensure to become a Registered Nurse (RN) by taking the National Council Licensure Examination (NCLEX). The nursing program at St. Luke's College offers a program of excellence providing graduates with the skills and knowledge to function as beginning nurse generalists. Review the ASN Program Outcome Data for more information on NCLEX-RN Pass Rates, Job Placement and Graduation Rates.